Wearing the WRONG SORT of jeans would mark you as an outcast forever. Pepe Jeans? No. Lee Jeans? HELL NO. Levi’s was the only option, and Levi’s 501s at that, even though they looked terrible on most girls. I suppose having ’501s’ at the end of ‘Levi’s’ makes one more comfortable about Levi’s inconsistent use of possessive apostrophe. I wore Reebok tracksuit bottoms for most of the decade not because my coolness levels were already so stratospherically high I didn’t need them (which of course they were) but because Mum, anticipating a Hulk-style growth spurt at any second, was understandably reluctant to fork out for expensive jeans which I would shortly render as useless as Bruce Banner’s. However my adolescent body refused to ‘spurt’ in any way (easy now), choosing instead to remain steady in its progress and jeansless in its covering. By the time I’d reached my final height I had to buy my own clothes, and anything costing more than a tenner was unthinkable when there were CDs queuing up to be bought. To this day I have never owned a pair of expensive, unflattering Levi jeans. THANKS MUM. The thing is, by the time Flat Eric turned up in 1999, the cool kids weren’t wearing jeans either. A couple of years beforehand, Steps discovered that wearing an apron over the top of your trews was a good way of concealing that said trews were in fact from Tesco, and All Saints realised that if you were going to cover up the label of your jeans you might as well wear combats instead. Even Levi’s seemed to stop bothering with major advertising campaigns for a while – perhaps because of the disappointment of ‘Underwater Love’ by Smoke City only getting to #4 after the excellent chart-topping work done by Shaggy, Jas Mann et al. Obviously something drastic needed to be done. Levi’s decided to base their ‘Sta-Pressed’ advertising campaign on a cult puppet belonging to French DJ/film-maker Mr Oizo. Flat Eric was neither flat, nor called Eric, and I don’t know of a single person who bought a pair of ‘Sta-Pressed’ jeans. This last ditch effort may have regained a brief glint of chart supremacy, but the last ten years have not been kind to Levi’s. Apparently are now millions of pounds in the red, as 501s aren’t skinny or elasticated enough for the kids of today who can’t even be arsed to read Sugar magazine. If they did, they would discover in the final issue under the ‘Hot or Not?’ section the new rules of cool: ‘must listen to French techno at all times, preferably accompanied by amusing Muppet video on Youtube’. Flat Beat kills both birds with one stone! 501s are still very popular in France. 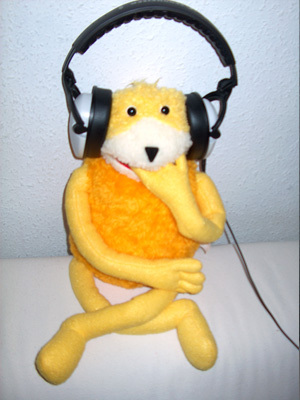 perhaps Mr Oizo is to blame. Over Christmas, I was told that Levi’s loses money on jeans it sells in the US, and pumps up the prices for overseas markets by like 300%. I guess it worked for awhile but teenage whims may cut this strategy off at the knees. Or the thighs, if short shorts ever come back in. I like Flat Beat, but I haven’t thought about it in aaaaaages.